A University of Reading graduate has paid tribute to the focus on innovation that was instilled in him during his studies, after he was identified as one of the biggest talents in the energy sector. Dr Marek Kubik was listed in the 2017 Forbes 30 Under 30 people to watch in the European energy industry in February. The list contains 300 of the brightest young entrepreneurs, innovators and game changers in Europe, across 10 industries. More than 15,000 entries from around the world means the list is harder to get into than Stanford or Harvard University. 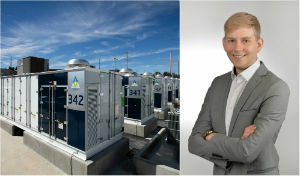 The 29-year-old leads the UK client solutions team for AES Energy Storage, a subsidiary of the AES Corporation. AES is a Fortune 200 global power company that provides affordable, sustainable energy to 17 countries. The company, Dr Kubik’s industrial sponsor during his doctorate at Reading, is behind the world’s largest lithium ion battery-based energy storage array, unveiled last month in Southern California. Forbes recognised Dr Kubik for his work on energy storage and how this can address the intermittent nature of renewable power. He was instrumental in the development of the UK’s largest and first fully commercial storage facility at Kilroot Power Station, in Northern Ireland. The 10-megawatt storage array, which uses more than 53,000 batteries, was opened in January 2016. Dr Kubik studied for his Engineering Doctorate (EngD) at the University of Reading’s Technologies for Sustainable Built Environments Centre between 2009-2013. Dr Kubik said: “I am deeply honoured to have been chosen for the list. Having met some of the other European nominees, I know the standard set for this is extremely high. “The Engineering Doctorate at the TSBE Centre at Reading placed a strong emphasis on taking groundbreaking, critical research and applying it in a real-world context. I thoroughly enjoyed my time at Reading researching the challenges of renewable intermittency, and it was a pleasure to work both with leading academics and industry to advance our collective understanding of these issues. AES Energy Storage is a leader in commercial energy storage solutions, operating the largest global fleet of battery-based storage assets in service today. Marek, also the recipient of the Energy Institute’s Young Energy Professional of the Year Award in 2015, returned to Reading on 2 March to speak at the Energy Seminar Series. There, he called upon the industry to not shy away from turning to new forms of flexibility when delivering solutions to ‘painful problems’. To find out more information about Marek, view his full Forbes profile and alumni page, or his personal website.